Ingrown hair. Razor bumps. Keratosis pilaris. These are just some of the things a glycolic acid lotion can solve. Impressive, right? But, there’s just one tiny problem. Picking a glycolic acid lotion that can actually work can be an intimidating experience. Just imagine going through dozens of similar skin care products, reading their hard-to-pronounce ingredients and trying to find out exactly what each of them can do. So, to make sure you won’t have to go through the same demanding process, we created this in-depth guide to choosing the most effective glycolic acid lotions. We dedicated 30 long hours reviewing published studies, reading reviews from Amazon and Reddit and consulting top dermatologists just to be extra sure with our top picks. Now, if you are wondering what our top recommendations are, check out our choices for the best body lotion with glycolic acid. 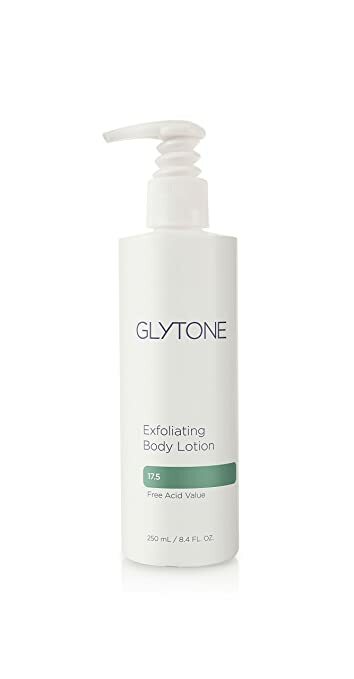 Glytone Body Lotion has a very thick consistency which means you’ll have to thoroughly rub the product to get it into your skin. For its effect, however, a lot of users claim that it actually works. With 17.5% glycolic acid, this product is good to use on dry skin and even on cases of Keratosis Pilaris. Most people who tried the product have seen positive changes in their ingrown hairs and razor bumps. Because of its high glycolic acid content, we suggest using the product with caution. As expected with highly acidic product, irritation and stinging may happen. Since it’s thick, this lotion may not be suitable if you’re always hurrying. If you want to give this product a try, then the best time to apply it is during night time to make sure you can rub it well without leaving any residue. Perfect Image Gly + Sal Exfoliating Body Lotion combines two powerful ingredients: 10% glycolic acid, it also has 2% salicylic acid. By buying this product, you’ll get 240 mL of product. It’s ultralight and has a quick skin absorption rate. Aside from its exfoliating properties, it also has cucumber and green tea to provide your skin good antioxidant and antibacterial sources. Most users were able to see a big difference in their skin tone in just one application. However, as with any product with these acids, you should expect a bit of tingling sensation after. The lotion has a thick and creamy consistency. Because of this, we suggest giving it a good rub to completely sink the product into the skin. Since it is thick, a handful of people had trouble making its pump work. There’s also faint scent in the lotion but it’s not something that would stick for a long time. 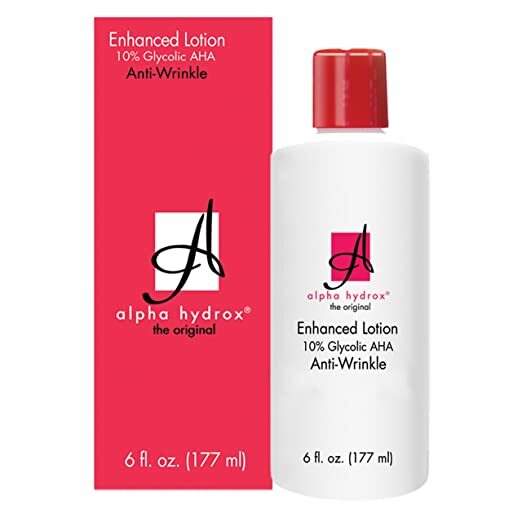 Alpha Hydrox AHA Enhanced Lotion comes in a 177mL bottle. Aside from its glycolic acid content, it also has Vitamin E that can help maintain your skin’s health. This product is suitable for people with dry to normal skin types. It’s fragrance-free and boasts a pH level of 4. The product won’t work well in completely removing deep wrinkles but it’s considered effective in minimizing their appearance. This lotion can help improve the tone and even elasticity of your skin to address skin aging. It goes well on the skin without any greasy feeling. The consistency of the lotion is neither too thick nor runny. A lot of users apply this lotion on both face and body. If you have highly sensitive skin on your face, however, we strongly suggest testing the product first for any irritation. If you have oily skin, then this lotion might not work well for you. A handful of users experience breaking out from this formula. With 10% glycolic acid content, InstaNatural Glycolic Acid Cream can’t only restore but also effectively hydrate your skin. For its price,, it offers more value for your money. The product comes with niacinamide, hyaluronic acid and CoQ10. It’s also packed with bearberry extract. With all these ingredients, the product can work well on any skin type. It can address aging concerns, sun-damaged skin and even clogged pores. The product has an orange color and carries a very mild sweet scent. After initial application, users were able to see a radiant change in their skin. As it comes with a strong color, you should be careful about staining your towel and clothes. If you are looking for an oil-free body lotion with glycolic acid, you shouldn’t miss Glycolix Elite 15% Body Lotion. It can gently exfoliate your dry and rough skin. Apart from that, this lotion is also formulated with vitamins A, C and E to nourish your skin. It also has green tea extracts to protect your body against free radical damage. Using it consistently can reduce your wrinkles as well as any redness you may have on your skin. Plus, it can also help you get back your skin’s youthfulness. Unlike other glycolic body lotions, this one appears to be less drying. Although it stings a little, it’s not too much to the point of being uncomfortable. However, if you have really sensitive skin, it’s best to use it less frequently. Start out with twice or thrice a week and see how your skin will react. If your skin is able to tolerate its glycolic acid content, you can use it daily or even twice a day. Glycolic acid is the smallest component of Alpha Hydroxy Acids. Since it’s the smallest in the group, glycolic acid is considered to be one of the most effective skin care ingredients that can address fine lines and wrinkles. This acid is frequently used in chemical peels. Aside from that they are effective, they are also considered safe to use. It’s a good exfoliating agent that can also provide moisture to your skin. As a general rule, make sure you don’t skip your sunscreen as glycolic acid can increase your skin’s photosensitivity. To get the most out of your glycolic acid lotion, it’s recommended that you use it no more than twice a day. Because it’s an acid, you also have to be careful about using the product frequently. It’s best if you start applying the lotion at night. Once your skin has become accustomed to its effect, you can begin introducing it to your daytime routine. If applied on your face, make sure to use some sunscreen after, particularly if you’ll be out in the sun. In case you’re using it on your hands, you should avoid washing them right after application. Although this acid can cause exfoliation, there’s still a chance for dead skin cells to remain on top of your skin. To address this, you can do manual but gentle exfoliation when you shower. In general, 10% glycolic acid is considered safe to use. If you want to use a lotion or any product that contains higher than 10%, it’s recommended to use it with caution or seek professional consultation first. The increased risk for photosensitivity is one of the most common concerns for people who use glycolic acid. With the right sunscreen and protective clothing, there’s minimal risk for hyperpigmentation and skin damage. Redness and irritation are expected with any exfoliating agent. If yours do not subside within a few days, then you should consider stopping the use of the product. You should also avoid picking at the peeling skin to avoid scarring and hyperpigmentation. Glycolic acid is a highly effective exfoliating agent. Although it can deliver results, you should also exercise caution in case you decide to try it on your skin. Glycolic acid lotions are considered safe to use on a daily basis. They can provide the same benefits without the high risk chemical peelings entail. In this list, we’re taking Glytone Body Lotion as our top pick and the best body lotion with glycolic acid. Aside from that it contains the safe 10% glycolic acid, it also has hyaluronic acid, niacinamide and CoQ10 to address skin aging.